Spring was certainly in the air on Monday morning. It was quite warm, and a very thick fog was over a lot of the coastal areas along the east of NE NSW and SE QLD. It quickly cleared and the suns heat began it's work warming up the surface. I had run through AVN profiles and was amazed at the instability. LIs were down -6 around our area, with CAPE into the thousands!!! Off the coast was crazy, at 09z (7pm local) LIs were down to -12 with CAPE around 1800!!! Unbelievable stuff, especially when I hasn't seen figures like that since last summer. What's more, at 06z (4pm local) 500mb temps were down to -21C!!! 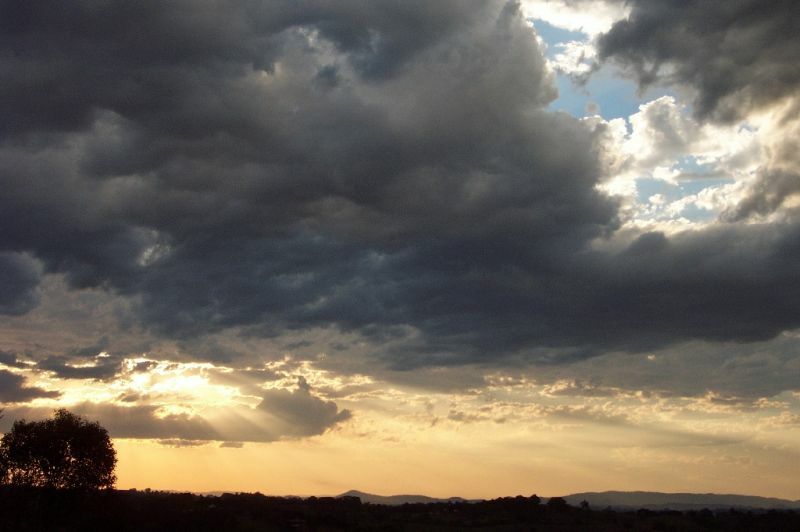 With surface temps predicted around 28-30C, the atmosphere was extremely unstable. Shear was ok, nothing too exciting, but not so bad that it was a concern. There were a few problems however. There was a lack of moisture in the lower levels with RH around 50%, picking up a bit to about 90% until 500mb when it became very dry (good for hail). What moisture there was was only hugging the coastline. Also, there was a cap over us, that appeared to be pretty strong. Fortunately there looked to be a convergence zone along the ranges to the W where westerly winds would meet more NNE winds, which would assist to break the cap. I headed off to school fairly hopeful that it would come together. damaging winds and very heavy rainfall. Around 1.30pm I looked up and noticed a whisp of cirrus blowing by overhead. Our school is in a valley so it's quite difficult to see what's going on in the western sky. I headed up to the library and managed to grab a computer. It took about 10mins to load but I finally got a radar image. There were scattered cells everywhere!! 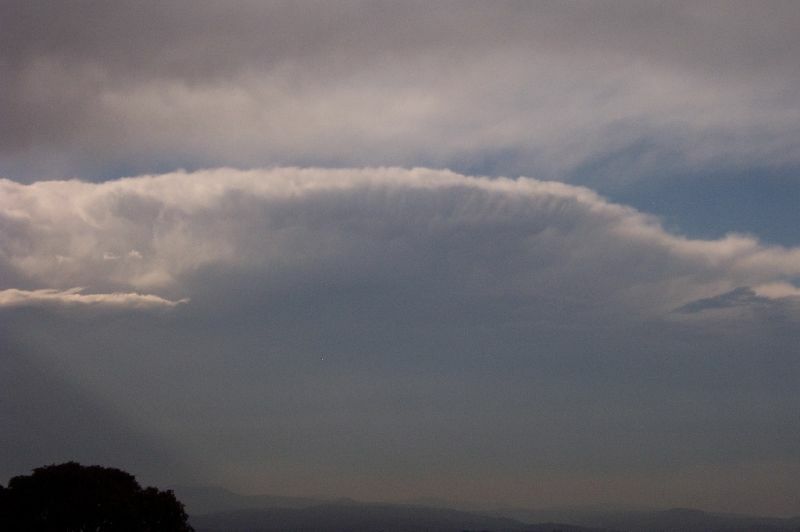 When I came back outside there was definitely an anvil going over the area. Being the last week of Yr12 classes were basically empty, so I decided to leave early and miss my last class! Good move, as by the time I got home, the sky to the west was turning black. When I got home and logged onto radar, the cells I had seen earlier were collapsing, but there was widespread activity. 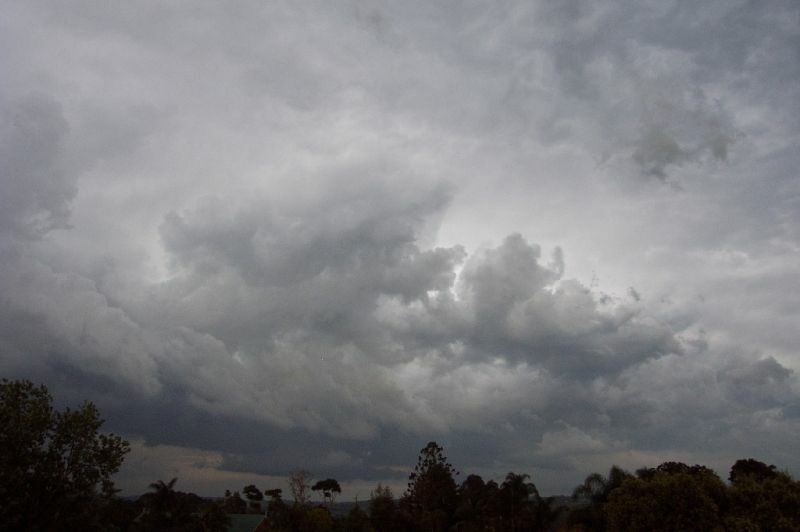 Activity had stretched into SE QLD, but had also begun to weaken. An STA was also current. I pulled out the ladder and climbed onto the roof. There looked to be weak activity from the north around to the south. At this stage I wasn't too encouraged, but the fact that the storms would be moving into more unstable air with more moisture made me feel a little more confident. The sky was filled with a bit of weak mammatus, nothing extraordinary. After a little while thunder became more audible. 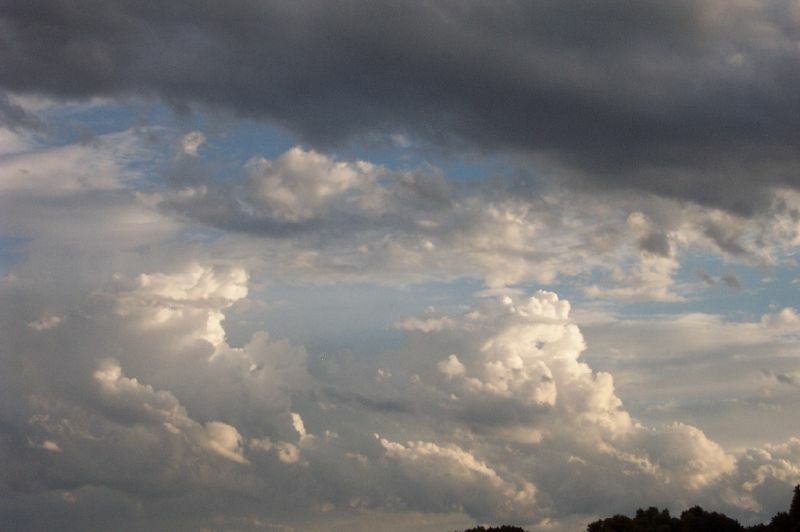 At this stage it looked as though the storms were going to pass to the SW of us, and we'd miss any action. Casino looked set to be hit. 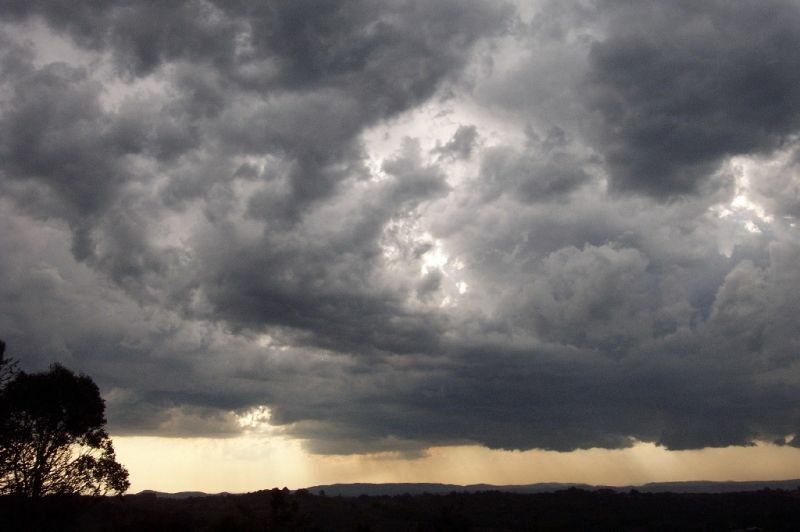 It was at this stage that the storms began to strengthen a little bit. By 2.40pm a cell SW of Casino reached red intensity on radar. The storms near Casino began to strengthen too, developing on it's northern side. 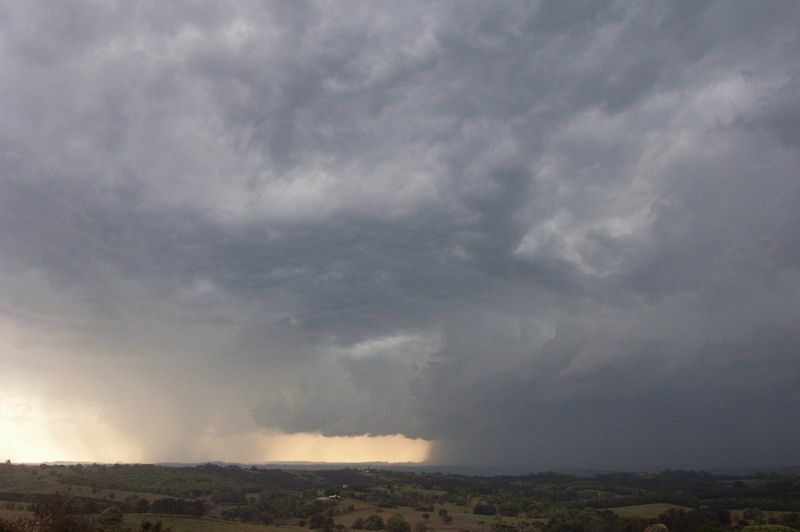 As the storm passed over Casino at 3pm the northern end of the cell developed over the Lismore area, producing pea sized hail at around 3.10pm. 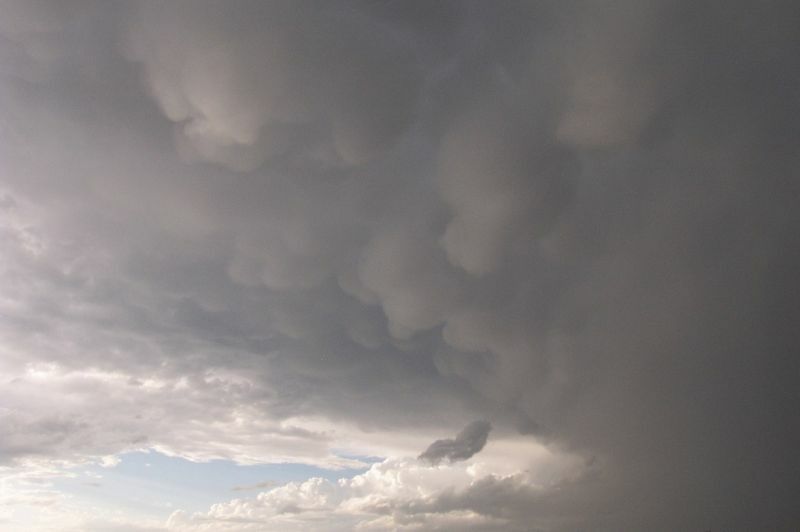 The sky was now filled with more defined mammatus and a cell to the south and to the north began to develop 'knuckles' on the edge of the anvils, which looked nice and solid. CGs and CCs were now quite visible and definitely audible, with very loud booms around. Whilst out in an open paddock taking photos an anvil crawler ripped through the clouds over my head. At this point I ran to the house! 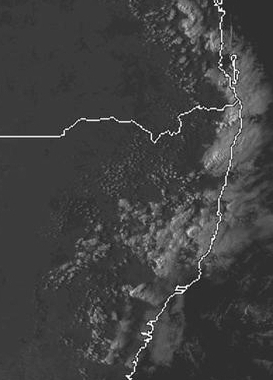 At around 3.20pm a weak looking developing guster could just be seen to the SW from the cells that were moving past Lismore and Casino. It looked quite nice against the hazy pink sky. Lightning was becoming a little more frequent, and much closer. Deep booms of thunder continued. 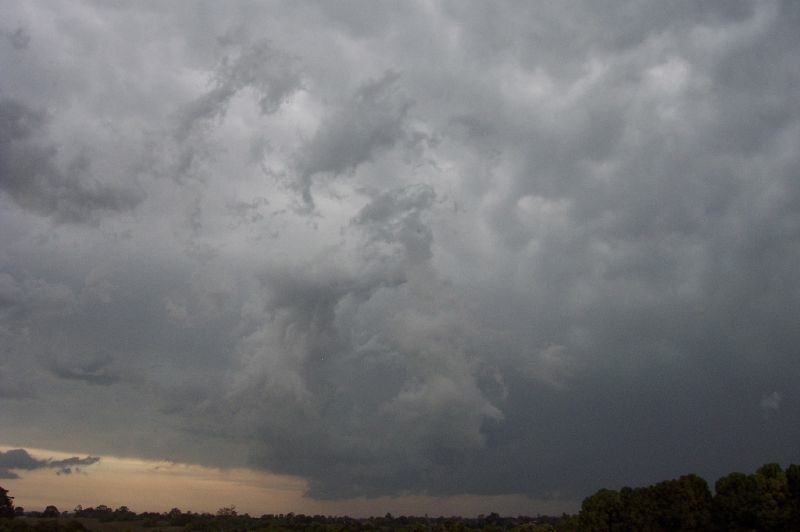 I decided to take the risk and climb back onto the roof to take some more pics of the cell to the SW. Soon after I climbed up another flash went overhead. I quickly got down and mum told me I wasn't allowed on the roof anymore. 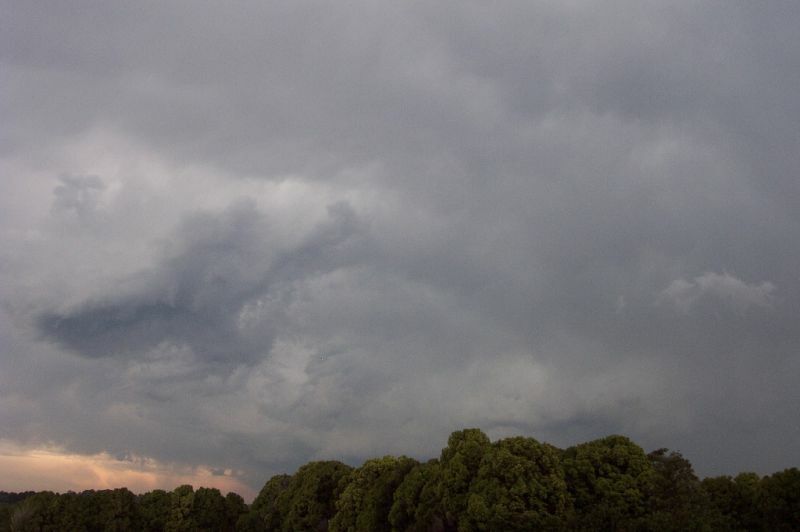 The sky was just filled with turbulent looking mammatus, and the cell to the north looked to be picking up a little. 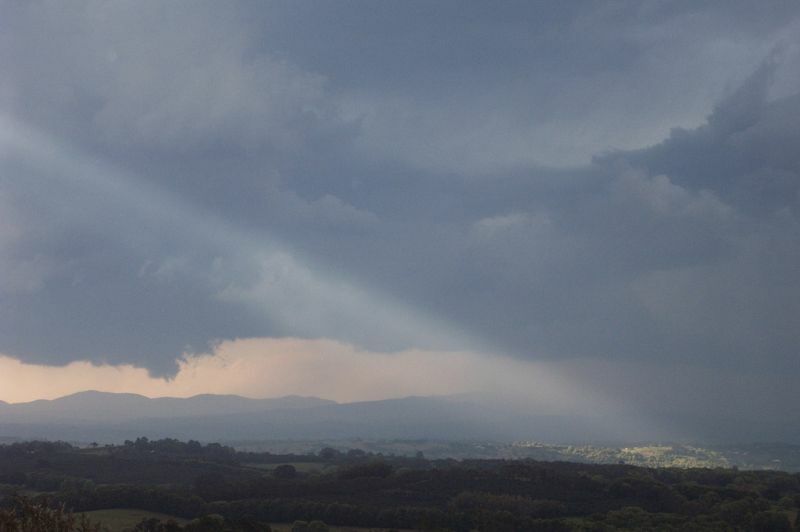 As the sky to the north became more clouded in with weak convection, a small clearing of cloud opened up and let a narrow beam of sunlight down from the sky onto a small area on a hill a couple of ridges over from my house. To say it looked fantastic was an understatement!! It was brilliant, one of the most beautiful sunbeams I have ever seen! 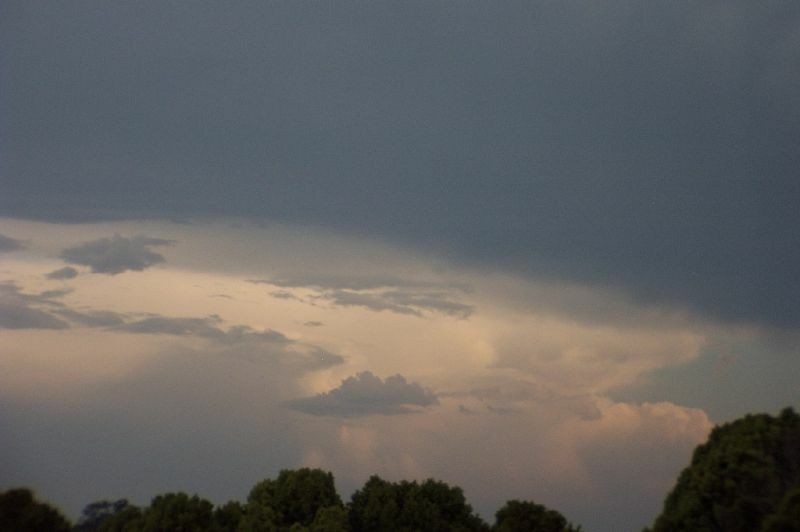 There were quite a few lowerings developing to the north, and it appeared that a cell was developing near the border. I checked radar and noticed that a cell had developed on the edge of a band of storms moving through SE QLD. 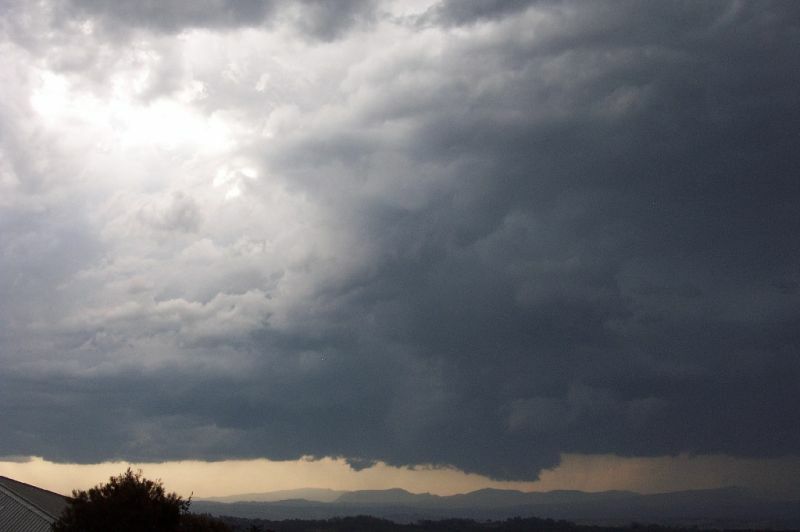 It looked like it would move through the Mullumbimby area towards Byron Bay. 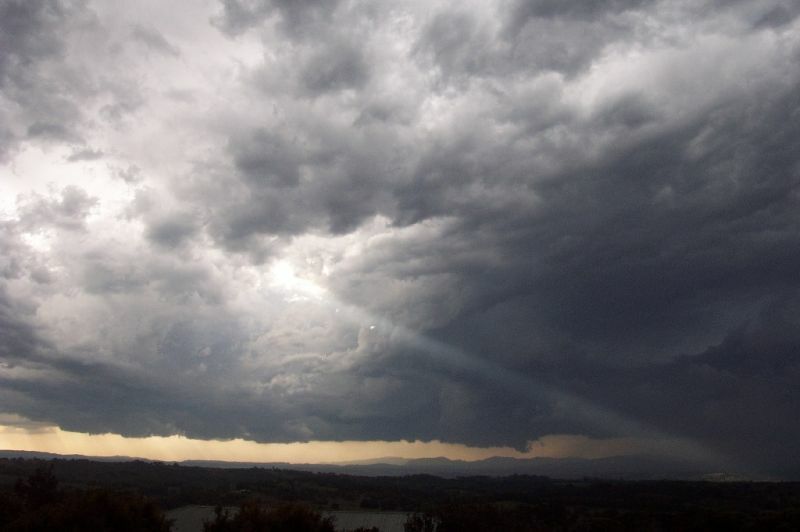 As my brother works in Mullumbimby, and always likes to know if it's going to storm, I gave him a quick call to let him know what was going on. Going by radar I told him if he left straight away he should stay ahead of the storm, as it wasn't there yet and was only green on radar. As I hung up the radar screen refreshed with the 4pm image and a big blob of red was right near Mullumbimby!!! I quickly gave him a call back and told him to stay put. 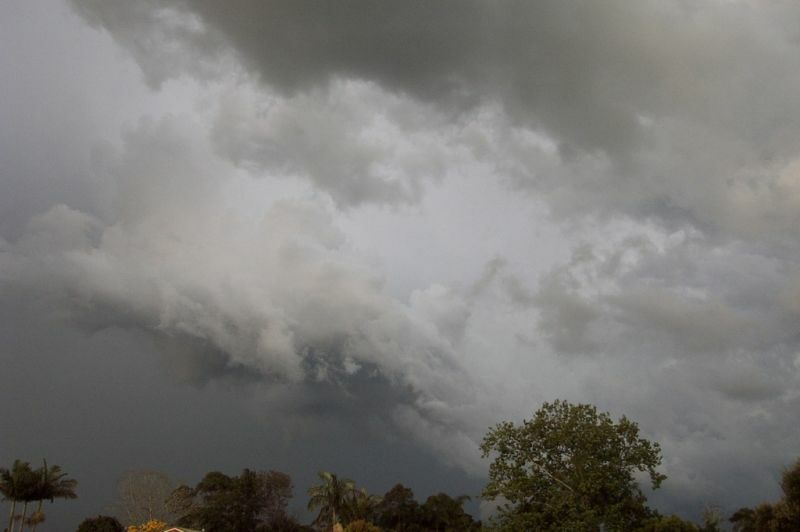 As I ran back outside to look, the base of the storm had disappeared and was replaced by a black wall of precipitation. 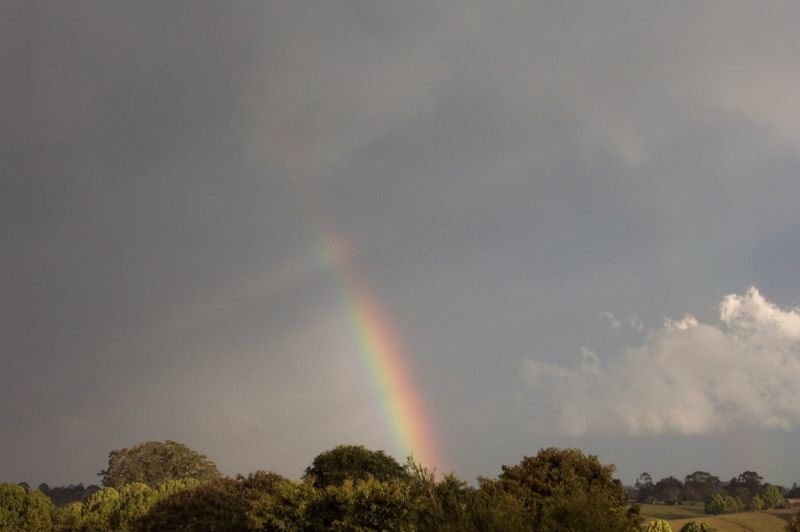 It looked amazing and a green tinge was present near the edge of the rainshaft. By 4.10pm the storms had quickly weakened and were just giving a small area of pink on radar, with green approaching Lismore. It looked certain that we'd get hit by a cell here, and with green on radar not too far away, hail was certainly on the cards. 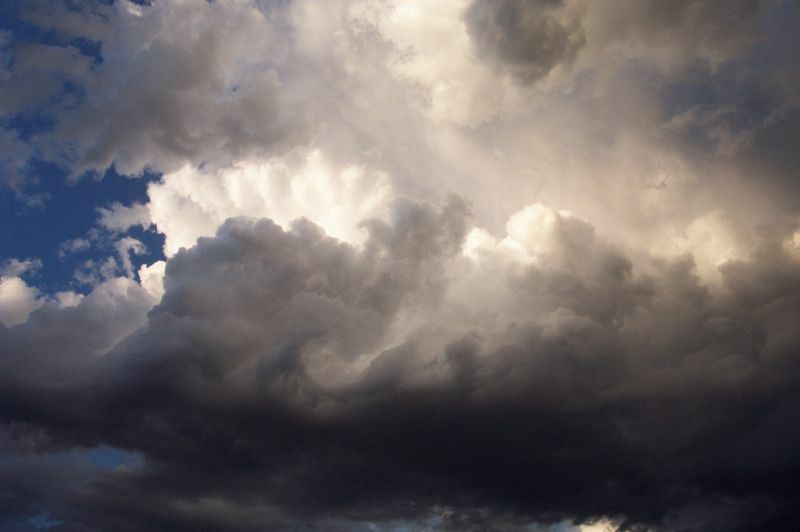 I waited and waited as a guster type cloud developed from the east through to the NNW. It looked really nice with the orange glow of the sky to the west, which was now clearing. Towards the sea where the other, more stronger cell was heading, was black, and the guster looked more intense. There were plenty of CGs and thunder around!! 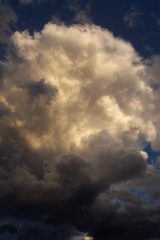 By 4.20pm the cell that was heading for us had weakened down to light blue, and visually the guster began to look less defined. 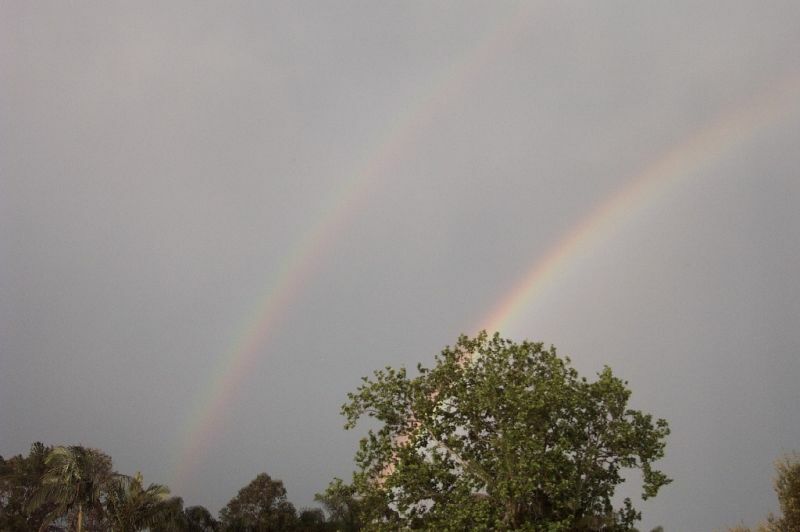 We were left with a very black sky to the east, with occasional CGs and a double rainbow that was fairly bright. It had been sprinkling large drops at my home for a few minutes, but I didn't record any rain on my AWS. 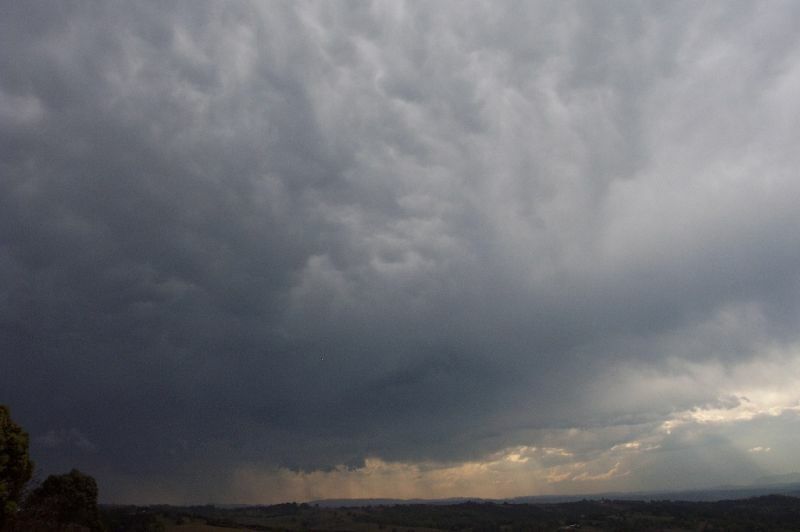 At 4.40pm the back end of the cell was visible, with very defined mammatus and a flanking line extending to the NW from the back of the cell. 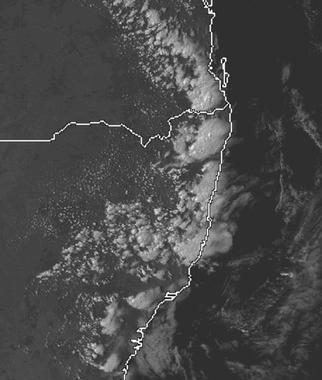 Storms in SE QLD were also visible and looked quite large off the coast. Just north of Ballina the cell went back into the pink as it crossed the coast, and remained pink for a few images after it crossed the coast. The sky was filled with the best mammatus I had ever seen. 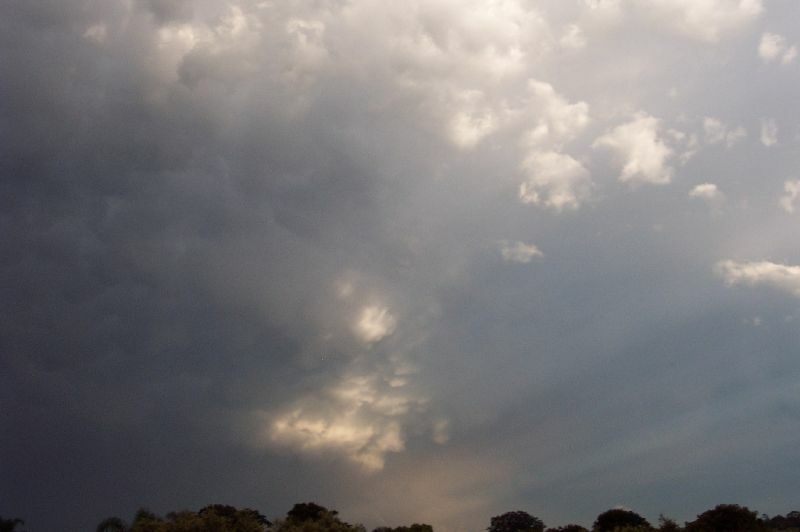 I was quite disappointed though that the sun was being block by other clouds and so couldn't illuminate the mammatus. Eventually some light snuck through and I got some nice pictures of the sky from the NE round to the SE. A renewed STA was issued. Hunter, and Central Tablelands east of a line from Mudgee to Bathurst. This advice is valid until 8pm and it should not be used after this time. 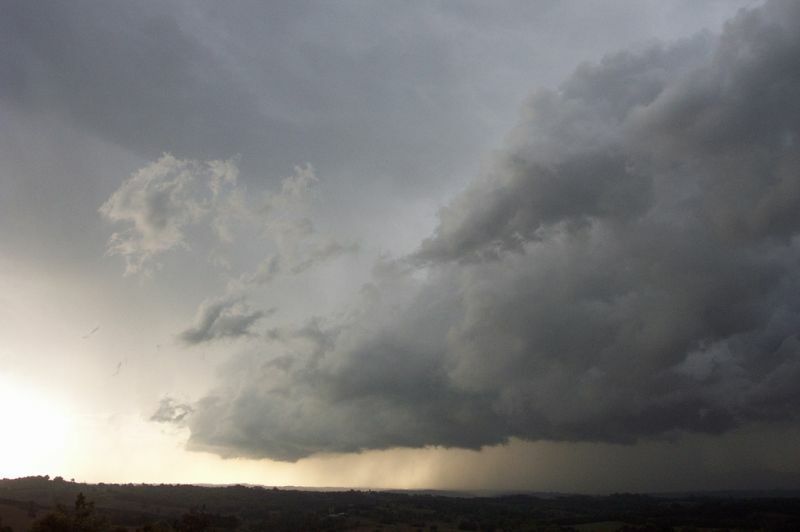 hailstones, damaging winds and very heavy rainfall. Michael informed me at around 5.20pm that there were some nice crisp updrafts outside. They developed rapidly and looked great. High contrast dark grey and white made them look perfect, and then as the sun set, the clouds developed orange tones. The sky at sunset was just beautiful!! I was hoping that some cells would develop later on and give a lightning show but this didn't happen. A large shower developed over our area at 6.20pm giving some brief heavy rain, but it didn't develop any further. 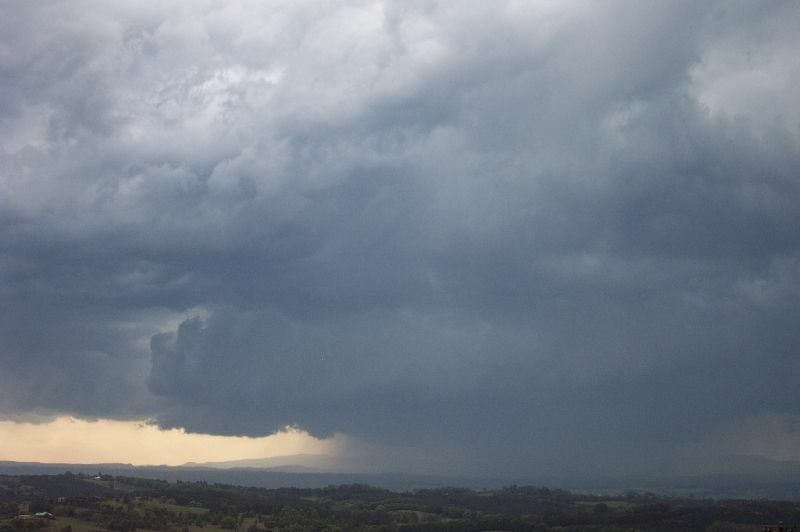 A few cells also popped up near Dorrigo around 7pm, but soon weakened. That was it for the day, but I had had more than enough. It was good to see a chancy setup pull off so well, and considering it's only September it was a real bonus!! From The Weather Company at 3pm and 4pm local.